St Chad was brother of St Ceed, on Ceeds death in 664 Chad became abbot of Lastingham Abbey. The well contains a pump and more modern tap, but both are currently dry. This guidestone is by far the most spectacular of the sequence across Blakey Ridge. It is said to date from around 1720 and carries the following inscriptions with carved hands on three sides. Another day, another boundary stone. The Pricket Thorn Stone is a listed building, again carrying an 18th century “TD” for Thomas Duncombe. Another in the collection of boundary stones on Blakey Ridge, this time Grade II listed but dropped from the current OS map. The larger stone again carries an 18th Century “TD” for Thomas Duncombe and an Ordnance Survey benchmark. The smaller stone has a number of rough inscriptions for which I have no explanation “JRH” “RM” and “EML” theres also an upside down “T” on the side. The trough which is fed by a nearby spring has featured on all OS maps since the first edition in the 1850s, although it now seems to have been dropped from the most modern mapping. It looks to have been relatively recently cleared of vegetation and repaired, but I can find no information on it. ‘Young Ralph’ is much better known than his older brother, being on the logo of the North York Moors National Park. A cross at this location may date back as far as the 11th century, but the current cross is thought to be from the 18th century. The cross is currently in three pieces after being damaged in the1960s (see photo) and 1980s. It actually seems to have been extended compared to this old postcard, and the “R” seems to be no longer there. 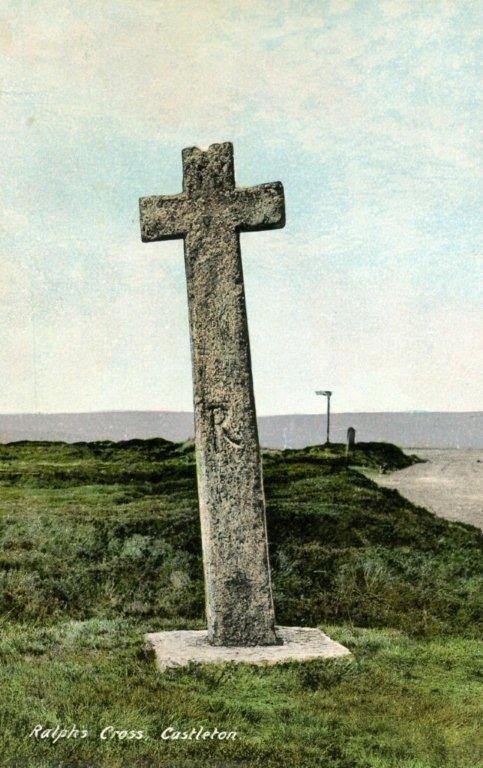 The common tale told is that of a farmer called Ralph erected the cross after finding the body of a traveller here, the hollow carved in the top of the cross being left to hold coins for anyone in need of help. My grandfather would always stop here and lift me up to put coins in the top.